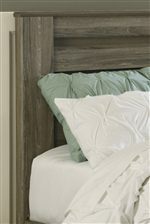 Incorporate the rustic style of this headboard into your bedroom for an updated look that is casual and inviting. 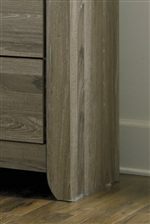 Raised panels on the headboard and footboard along with generously scaled pilaster create a unique horizontal pocket detail that offers visual interest. The Zelen Full Panel Bed in Warm Gray Rustic Finish by Signature Design by Ashley at Furniture Barn in the Pennsville, Bear, Newark, Hockessin, Middletown, New Castle, Townsend, Talleyville, Wilmington, Marshallton, Smyrna, Elkton, area. Product availability may vary. Contact us for the most current availability on this product. B248-84 Full Panel Footboard 1 56.85" 3.62" 20.63"
B248-86 Full Panel Rails 1 84" 10.25" 2.25"
B248-87 Full Panel Headboard 1 56.77" 3.07" 53.7"
The Zelen collection is a great option if you are looking for Casual furniture in the Pennsville, Bear, Newark, Hockessin, Middletown, New Castle, Townsend, Talleyville, Wilmington, Marshallton, Smyrna, Elkton, area. Browse other items in the Zelen collection from Furniture Barn in the Pennsville, Bear, Newark, Hockessin, Middletown, New Castle, Townsend, Talleyville, Wilmington, Marshallton, Smyrna, Elkton, area.